How To Get Rid Of An Ingrown Toenail? There are a lot of resources available about Ingrown Toenail Treatment. Many of which are short and, well, not very complete. Many are also part of a larger site and may only touch upon this painful and critical issue facing many people today. 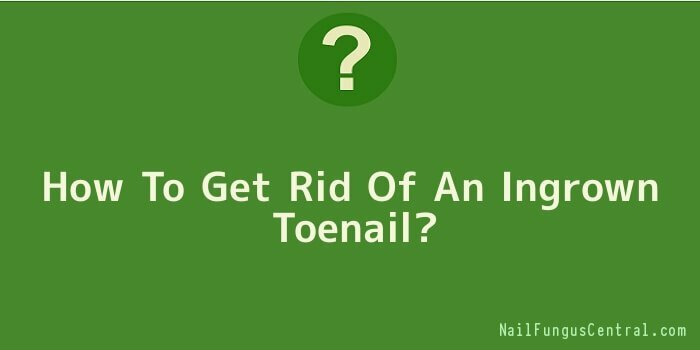 How to get rid of an ingrown toenail is the go-to website for your entire ingrown toenail needs. If you just need to learn a little bit to take better care of your toenails or are in dire need of some answers and solutions to ingrown toenail problems, we are here to provide great information to help you. Have you ever had to go to a job interview with ingrown toenail pain pulsing through your foot? Or, wondered how to fix an ingrown toenail prior to that interview so that you could almost be at your best? Well, we’ve been there and we’ve wished we could have had a central point to find out not only how to treat an ingrown toenail but also how to reduce if not eliminate further complications. NOTE: Knowing when to seek professional medical care is so important as well. When in doubt, Doc it out! Infections in general and especially bone infections are not to be toyed with. Although we make every effort to make sure the information presented here is accurate, everyone has a different level of knowledge and skill when it comes to taking care of medical issues. Also, your experience may be different from the next person. So, when in doubt, please seek professional medical advice. Our goal is to provide you with a centralized point of information to meet your needs whether it is finding out about what can be done regarding ingrown toenail home treatment, what is available regarding ingrown toenail surgery or if you just want to find out what is an ingrown toenail and what you can do to relieve the pain and prevent or reduce any problems in the future. We know first-hand how painful and incapacitating an ingrown toenail can be as well as the impact on your life, work and overall quality of life. We’re here to provide the best information available and maybe even give you some options you weren’t even aware of.